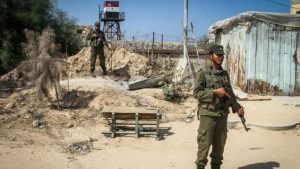 A security agent, member of Gaza ruler Hamas, died after confrontation with members of a reportedly Salafi group, near the border between the enclave and Egypt. “A security force stopped two persons who approached the border. One of them blew himself up and was killed. The other was wounded,” the Hamas-run Interior Ministry said in a statement. The confrontation also left several Hamas security forces wounded. One of them died of his wounds, medical sources in the enclave told reporters. The Islamist movement pointed at a Salafi group for the blast. The resistance movement has beefed up security at the border between the enclave and Egypt as part of rapprochement with Cairo. Hamas has begun construction of a safe area at its border with Egypt. The buffer zone is designed to prevent Islamists’ infiltration into the Sinai where the Egyptian army has been battling militancy. Cairo accused Hamas of providing a safe-haven for militants. Gaza’s Salafis support the Islamic State group (IS) and al Qaeda’s holy war. Hamas has shown little tolerance for Salafi movements, detaining many of their members and raiding homes in searches for weapons. Posted by KanelkaTagba on Aug 17 2017. Filed under Headlines, World News. You can follow any responses to this entry through the RSS 2.0. Both comments and pings are currently closed.